Some houses seem more fated for their owners than others. So it was with Doug and Nancy Lashley’s home in West Bath. An Annapolis, Maryland–based couple, they had looked at 55 properties during a three-year search for a Maine property. They were no strangers to purchasing and remodeling. Doug has renovated 60 investment properties in his years as a lawyer and founder and CEO of GreenVest, a firm that specializes in ecological restoration, mitigation services, and sustainable land planning. Still, the Lashleys’ desires for their own home were quite specific. They wanted to be on a tidal inlet, no more than 30 minutes from Portland, and farther north than the Kennebunks. In 2011, a day before they were leaving Maryland for a fall golf trip to Rockport, a real estate agent asked if they had ever considered the old yacht club in Bath. They didn’t know the place but stopped at 6 a.m. the next day to have a look. The property was on Mill Cove at the end of a road that led to the tip of a peninsula jutting into the New Meadow River. It included a large main house and four ancillary buildings, all locked and boarded up for winter. Still, they separately walked the land, and when they met up 15 minutes later, Doug told Nancy, “This is it.” It was Saturday, October 22. Their wedding anniversary. An aerial view of the Lashley’s home, Ledgemere. Not that they bought the property without going inside. That they did the next Monday morning. Save for limited rental activity, the structure had sat vacant for two years. It had been built in 1902, originally for private use, before it became the New Meadow Yacht Club from 1914 to 1948. After, it returned to private use. By 2011, it clearly needed work. Still, the wood interior had beadboard walls and Douglas fir floors and ceilings. Not one bit of plaster or drywall. The Lashleys could easily see the potential. True, they had not intended to purchase such a large place, but they did want a gathering space for their five children and seven grandchildren. The six bedrooms on the second floor would come in handy. Ditto the third floor, which might serve as a playroom. 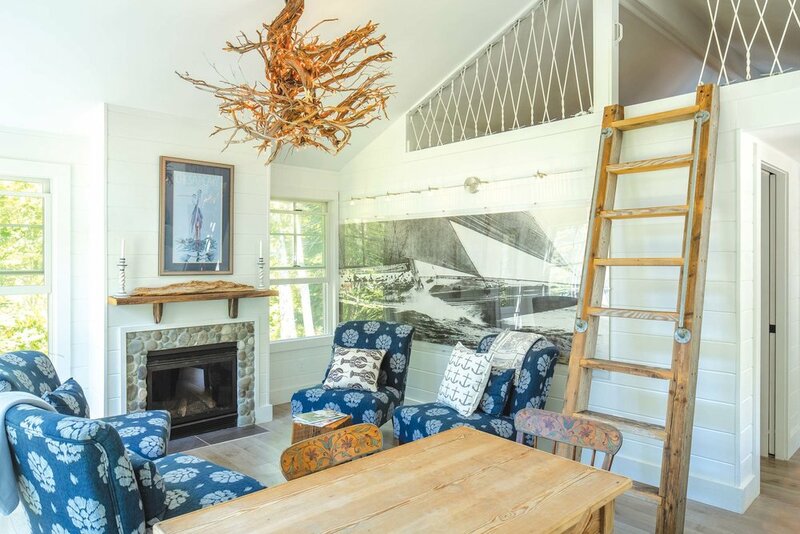 One outbuilding could become a guesthouse, another a painting studio for Nancy, a commercial artist and the founder and CEO of Lallie, a design and printing company specializing in celebratory cards and invitations. Plus, the couple had both sailed competitively and continued to be avid sailors. The yacht club history spoke to them. They made an offer, and the house became their shared project. Nancy had sold Lallie a handful of years earlier and had time for the effort. The massive living room fireplace is made of local granite and separates the living and dining room. The corner cabinet and Douglas fir ceiling are original. A new, non-structural white beam is intended to define the space. Nancy wanted a backsplash that depicted the iconic Maine lobster feast. This custom-made tile illustrates a platter of lobsters, clams, mussels, and corn. “Like many old houses,” says Bath-based architect David Matero, “the house was broken up into separate rooms and the kitchen was hidden away.” His new design refashioned the ground floor into open space with some definition. A large double-island kitchen, coextensive with the living room, “is at the heart of house,” says Matero, as the Lashleys loved entertaining. One island was for cooking, the other for socializing. An existing 50-foot-tall brick chimney was replaced with a massive granite-slab chimney, which offers a sense of separation between the dining room and living room without fully closing off the rooms. A narrow entry hallway and bathroom were reconfigured into a more gracious foyer, several bathrooms were redone, and a later addition to the corner of the house was removed and refashioned as an office with abundant windows. The exterior was “massaged,” says Bailey Island–based builder Eric Smith, to reduce the mass of the building. This included a new entry porch with a large gable and wide stone steps, decorative corbels, a box window, outdoor shower, and a metal roof overhang on three sides of the home. An enclosed porch with a yacht club lifesaver, bar area, game table, and blue ceiling, the latter a custom in South Carolina (where the tradition seems to have to do with warding off evil spirits) and in New England (where the custom may have to do with fooling insects into not building nests.) Other theories about why people paint porch ceilings blue? It resembles the sky. Despite these changes, much was saved or repurposed. The original high-ceilinged bedrooms were left largely intact or cosmetically repaired, as were the original wood interior and built-ins like the dining room china cabinets. Existing furniture was reused, including bed frames, small tables, and wicker furniture. Select dressers and a dining room hutch were refashioned as bathroom vanities. One original interior door became a pocket door for the new office. Two others were turned horizontally to become bed headboards. Oars and lifesavers from the boathouse were used to decorate walls. Through their builder, Nancy and Doug found an iron fabricator in Portland to fashion two old anchors into a hanging pot rack for over a kitchen island. Work on the house was completed by Thanksgiving of 2017. Tragically, Nancy is no longer here to enjoy the fruits of her labor. She died after a four-month struggle with cancer in December 2017. In the end, she devoted the last five years of her life to the restoration of Ledgemere—so called because the house is built on a granite ledge—as a place for family and friends. It remains a social place. “Her spirit and her talent and her skills are everywhere here,” says Doug. Even so, her loss weighs heavily. Doug now has an annual summer Olympics for the grandchildren, a final event of which involves dropping 15 feet from a zipline into an inner tube moored in a cove bordering the property. The winning team members receive passes to an ice cream parlor, a weekend at the house, and their name on a trophy called “The Ledgemere Cup.” Nancy was an accomplished athlete and a spirited and affectionate woman. Since last summer, and going forward, the prize—and the house itself—is very much in her honor. Doug used pieces of an old dock to make a ladder to the guest room loft, which has rope attached to boat cleats in lieu of conventional railing. 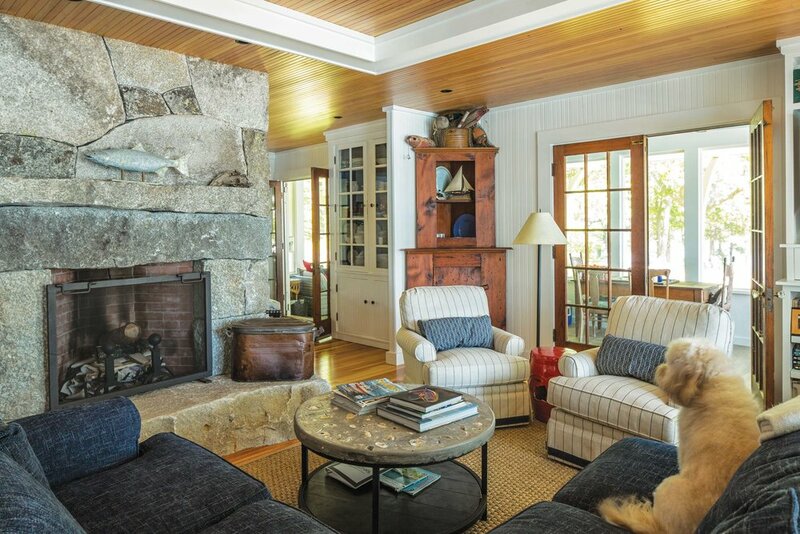 The fireplace mantel is made from materials found on the beach, as is the stone fireplace surround.